Come Get out the Vote with Us!!!! 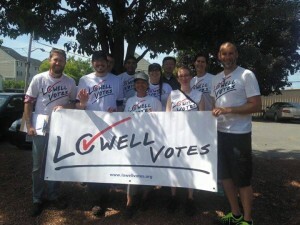 Join us for training and a paired up walk to canvass in Lowell’s neighborhoods. Refreshments will be provided for canvassing teams. Please join us or tell your friends, family, colleagues or neighbors about this important opportunity to increase voter turn out in Lowell. Just show up or email us at info@lowellvotes.org to find out more. We are also looking for folks to table at events registering new voters. Want to hold up signs and banners at high traffic and visibility locations in the city? We are looking for folks to do that too. Just contact us – http://www.lowellvotes.org/contact/ . position is 25 hours a week from August 22, 2015 to November 27, 2015 (14 weeks) with a $400/wk stipend. Download the job description here: Field Coordinator – Lowell Votes. Application Deadlines: August 10, 2015 @ 5pm. We’ll have great progress to discuss and need you for our next steps! Please “join” the Facebook event and invite your friends!